Fruit quality in melon (Cucumis melo) and in other cucurbit species is primarily determined by sweetness, acidity, aroma, color and shelf-life. During ripening, the mesocarp (fruit flesh), the consumed tissue, generally softens due to degradation of cell walls, and accumulates soluble sugars, organic acids, volatiles and additional secondary metabolites. Flesh and rind color undergo developmental changes, the most noticeable of which are changes in pigmentation. 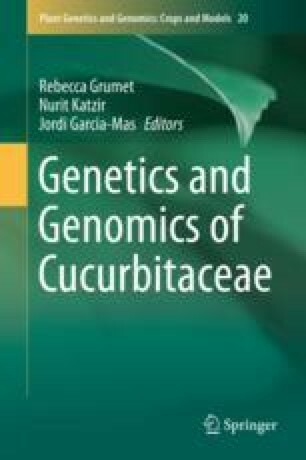 This chapter reviews the current knowledge of genes that regulate, or participate in, the major metabolic pathways affecting sugar and acid metabolism (sweetness), volatile organic compounds (aroma) and pigments (color) of the melon fruit.